This Thanksgiving week, General Motors has officially ceased production of it’s Pontiac brand of vehicles as a result of the bailout by the U.S. government. Not only could the car maker not meet it’s financial obligations but, the fact is that the car’s brand no longer had the appeal it once did and sales were declining. http://www.pontiac.com/ has the official closeout information on remaining vehicles for sale with deals as low as o% financing for six years or cash back offers up to $4,500. As a wake up call to anyone buying a car, six years is an absurd amount of time to pay off a car, especially when the warranty ends before you pay it off. With discount offers like this across most of GM’s product line up, how they are ever going to make money, get out of bankruptcy and away from government ownership is beyond any one’s guess. Besides the 1000’s of job losses at Pontiac plants, NUMMI the joint venture between GM and Toyota venture looks to be shutting its doors as well. http://www.mercurynews.com/drive/ci_13766495 From the Bureau of Labor Statistics unemployment by state http://www.bls.gov/web/laumstrk.htm is listed. Like the climategate, how true these numbers are is any one’s guess. I recall the 1978 Pontiac Bonneville that I learned to drive in. What a tank, but it had the radio antennae built into the glass which was pretty cool. In 1982 came the Firebird and was featured on the TV Show Knight Rider. I never owned one, but a lot of my buddies did and it was a girl magnet. 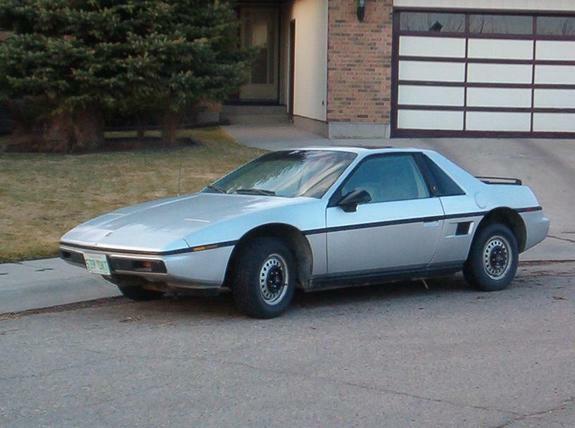 In 1984, my dad through a mid life crisis or whatever, found the Pontiac Fiero much more in the spirit of things. What a car it was and far removed from anything on the market. The damned things body was made of plastic! We’ll some sort of poly-resin- that when a grocery cart hit it it bounced off with no damage. With no USA steel to give it strength, on impact the car crumbled. Luckily, we never crashed it but traded it it on something or another. Might have been the Cadillac Sedan De Ville with the horrendous 4-6-8 valve engine- another GM disaster. Our Fiero was hot red in color with every option known to man, including the fabulous sound system from Bose. Nothing like Van Halen screaming at you at ten decibels while driving down the highway. A definite babe magnet of a car. It made you want to live in the fast lane or at least drive in it. It didn’t turn out so good for the Indians being forced to reservations, but in the long run some tribes are probably more financially stable than the U.S. government, thanks to good fiscal policy and casino’s. At less than $5000 USD an acre that was a good deal for any pilgrim. Good day. I ran across your web page by mistake and was glad that I took a second to look. My father and my friends have started doing a huge lot of web research to locate apartments in Italy and where to stay and what not. Anyways, thanks for the advice – excited I ran across it by accident and will keep in mind. With research I begun putting together information about Florence apartments for my blog.